Head of dwindling Jewish community in Lebanon: 'Not all Jews are Zionists'; country's oldest synagogue set to re-open after renovation which even Hezbollah supported. Head of Lebanon's Jewish community Isaac Arazi, spoke for the mere dozens of Jews in the mostly Muslim country, and said that, "We have no connection to those who wanted to live in Palestine and kill innocent people." He made the comments to the London based publication A-Sharq al-Awsat. "Not all Jews are Zionists," Arazi said. "We identify as Lebanese and we belong in Lebanon one hundred percent. Our condition is just like that of the rest of Lebanon. We suffer just as they do from politicians and officials whose only worry is how put our money in their pockets." Arazi's comments come just before the imminent re-opening of Magen Abraham, Lebanon's only synagogue that was destroyed during the country's civil war in the 70s. "We are investing lots of resources into reviving the Jewish community by renovating Magen Abraham, the only synagogue that's left. It's located in the neighborhood where most of the Jews used to live," said Arazi. "We even raised money from Lebanese Jews outside the country, but Christians and Muslims also helped us renovate. 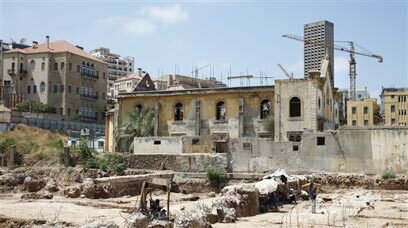 Even the company that's responsible for development and rehabilitation of Beirut helped us in accordance with the law that the state should help to renovate houses of worship." 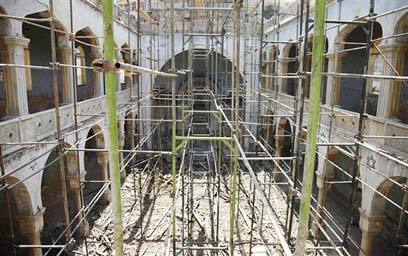 Arazi estimates the cost for renovations is roughly $1 million and said work began on the project in May, 2009 as part of reconstructions efforts following the 2006 war with Israel. Even Hezbollah supported the project saying, "This is a religious place of worship and its restoration is welcome." A Hezbollah spokesman added that, "We respect the Jewish religion just like we do Christianity. The Jews have always lived among us. We have an issue with Israel's occupation of land." While Arazi feels that seeing himself as Lebanese separates him from Jews elsewhere, and protects him from Hezbollah's opposition to Israel, A-Sharq al-Awsat also reported that some in Lebanon find it hard to make such distinctions. "There's no such thing as Zionist or Jewish," said Sonia, a 60-year-old member of Lebanon's Jewish community. "The Jews are all one and there's no way to run from their identity," she said. Sonia said that her non-Jewish husband's family was opposed to her because of her religion. According to her, "I left my family when they decided to go to Israel to live there. I chose to stay in Lebanon with my husband and my children." See all talkbacks "Lebanese Jewish community: We have no connection to Israel"